-- Select a Size -- X-Small Small Medium Large X-Large 2X-Large 3X-Large 4X-Large - Out of Stock! 5X-Large - Out of Stock! 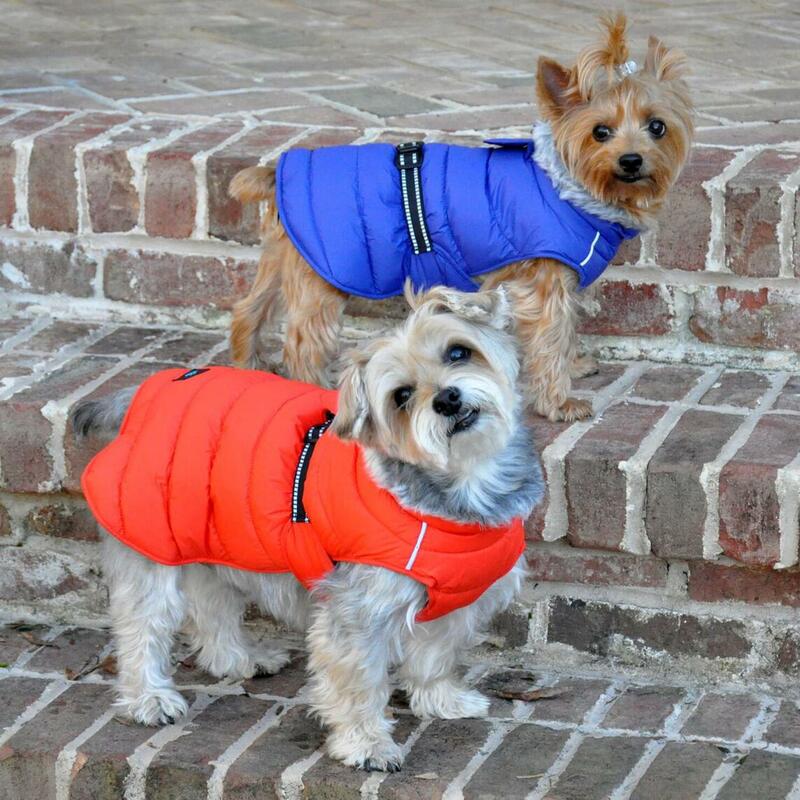 Don't let cold weather keep your pup from enjoying the season with the Alpine Extreme Weather Puffer Dog Coat by Doggie Design in Orange. 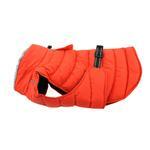 Alpine Extreme Weather Puffer Dog Coat by Doggie Design - Orange Customer Photos - Send us your photo! Murphy loves his new winter coat and looks so handsome in it. Laila is our granddaughter who is recovering g with us for awhile. She is a well trained daughter of an Army Captain. Posted On 02/02/19 by John A from , IA Yes, John A recommends this product! I love this coat, but though I've bought two sizes I can't get a size that will fit. The first is too big. I can't return it (I think) because I've tried to alter it. I bought the next size down but it's too small. It's so attractive, I wish it would work. Posted On 02/20/18 by Karen from Somerset, NJ Yes, Karen recommends this product! The Alpine Extreme Weather Puffer Coat is not only beautiful but it's the most well made coat we have ever purchased for our pet. It is super stylish...worth every penny. Our dog was in between sizes so we ordered the smaller size, which ended up being a tad bit smaller. So I quickly ordered the larger size, afraid that they would be sold out. Our intent was to ship the first one back, but our daughter came over and saw the coat, LOVED IT, and she purchased it from us for our grand dog so that I didn't have to send it back. Best purchase ever! Posted On 02/08/18 by DeAnne K from , NE Yes, DeAnne K recommends this product! Our granddaughter came to stay with us from TX. In February we were scrambling to find a coat. One call to Baxter Boo and the staff helped us find the best fitting coat. When it arrived we were shocked at the superior quality, lofty warmth and great value. 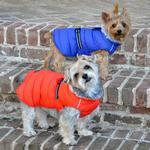 Will be ordering Alpine coats for our other girls. Highly recommend. Posted On 01/19/18 by Keith from , NH Yes, Keith recommends this product! I am very pleased with this coat. I needed a warm, quality parka for the single digit temps we've been having. Right out of the package it feels like a quality product, not cheap or flimsy. All of the materials feel solid and durable and the stitching is tight, tidy and strong. I love the design, especially the complete chest cover, the fact that there is no velcro to wear out, and that it is quick and easy to put on (watch the video). Keep in mind the listed dimensions are those of the coat, not your dog. I got a 4XL for my 65 lb German shepherd - hound mix (neck 20", chest 34", length 25") and although it's a tiny bit roomy, the length is perfect for covering his haunches so I decided not to downsize. The belt and the neck are both adjustable so I can still get a nice, snug fit. My only suggestion would be to have nice big reflective strips running along each side. The only reflective material is on the belt and it's not very noticeable, so buy orange! I have uploaded photos as well. Posted On 12/17/17 by Lauren C from Denver, CO Yes, Lauren C recommends this product! Jacket was too small so will have to return. Also realized that this place doesn't even refund you the full transaction amount, you lose shipping it from the original purchase and also to send it back. Horrible policy, shame on me for not reading fine print. Posted On 11/25/17 by Jesus M Ramirez from San Angelo, TX Yes, Jesus M Ramirez recommends this product! i enjoyed the overall experience with BaxterBoo. I think that there is a large variety of items on sale which is great. I just hope that i by selected the $10 postage option, i dont receive my item in a months time when winter is over.